A few days before Jesus was crucified, He was in the Garden of Gethsemane praying late one night. He was so overwhelmed with the weight of what He was about to do and under so much pressure that His sweat was like blood dropping to the ground. He said, "Father, if You are willing, take this cup from Me; yet not My will, but Yours be done" (Luke 22:42). We celebrate what Christ did on the cross, which is the foundation of our faith, but the real battle took place in the Garden. That's where He made the decision, "Even though this isn't fair, even though Judas is about to betray me, even though these people have no right to mock and ridicule Me and condemn Me to die on the cross, Father, I trust You. I know this is all a part of Your plan." There are times when life is not fair, when people have come against us, when we're fighting an illness, when the business fails—that's when you have to do what Jesus did and say, "Father, this doesn't make sense to me, but I trust You. I know You're in control, and You wouldn't have allowed it if it wasn't going to work for my good." Don't get discouraged when you don't understand it. God is up to something. The Scripture says, "The steps of a good man are ordered by the Lord" (Psalm 37:23). It doesn't say He suggested them. No, God is strategic. Before you were formed in your mother's womb, He laid out a specific plan for you. Nothing happens randomly—not just the good breaks, the promotion, the times you see favor, but even the closed doors, the disappointments, and the betrayals are a part of God's plan. If you don't understand that, you'll be frustrated when things don't go your way, upset because somebody does you wrong, and bitter because the door closed. In reality, these were ordained by God as setups to move you up to a new level of your destiny. They crucified Jesus and put Him in the grave. They thought He was done, but on the third day He came out and said, "I am alive forevermore!" God has the final say. He has you in the palms of His hands. You may not understand it, but He's already planned out your days. If you stay in faith, God is about to turn things to your advantage. 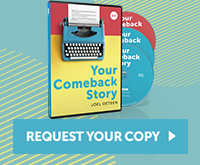 It looks like a setback, but it's setting you up for breakthroughs, for promotion, for vindication, for healing, for the fullness of your destiny. I met a young lady recently who told how as a little girl her parents were on drugs and abandoned her on the street. She was passed from foster home to foster home and went through all kinds of unfair things, abuse, and rejection. What she was saying, however, didn't match who I was seeing. I should have seen someone who was battle-scarred, insecure, and struggling. Instead I saw a beautiful, confident, strong, and well-spoken lady. I thought she had come from a loving family and had a healthy childhood. Just the opposite. All the odds were against her, but she had her college degree and a successful career, a loving husband, and two beautiful children. That's the way God restores. He brings you through with no sign of the difficulty, no sign of the betrayal, no sign of the loss. In the book of Daniel, when three Hebrew teenagers wouldn't bow down to the king's golden idol, he was so upset that he had them thrown into a fiery furnace. They should have been instantly killed, but the Scripture says, "Not a hair on their heads was singed, and their clothing was not scorched. They didn't even smell like smoke!" (Daniel 3:27). To just survive that would have been a great miracle, but notice how God works. When He restores, there's no sign of what you've been through—the trouble, the injustice, the bad break. God is so amazing that when He restores, you're not even going to smell like the fire you've been through. Isaiah 43:2 says, "When you walk through the fire, you will not be burned. The flames will not harm you." We all go through the fire—things that are unfair, things we don't understand. In the fire, you have to remind yourself, "This fire is not going to burn me. This challenge is not going to keep me from my dreams. This sickness is not going to stop my purpose. These people who have done me wrong are not going to sour my life." When people met the Hebrew teenagers in years to come, they just saw three healthy, whole men. There were no scars, no permanent harm. You may be in the fire now, but like with them, it's not going to set you back permanently. When you come out, you're not going to be scarred for life. There's not going to be any sign of the fire, any sign of the sickness, any sign of the addiction. You're going to come out without the smell of smoke. Things are changing in your favor right now—healing, vindication, promotion, breakthroughs are on the way.